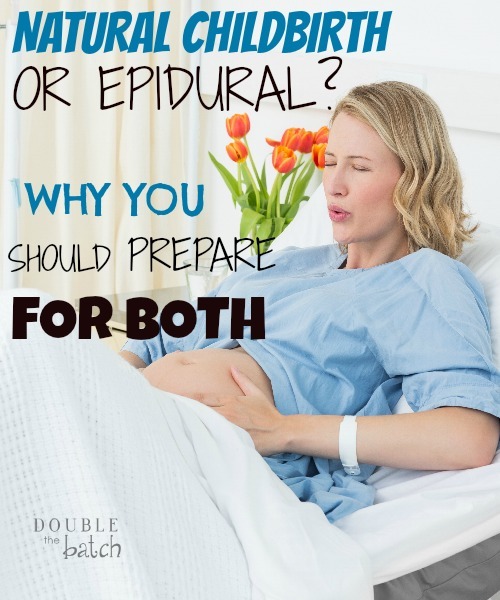 Whether you are completely set on having a natural childbirth, or completely comfortable with and counting on your decision to get an epidural, here are a few reasons you might want to consider preparing for both as your happy day approaches. Our sweet little daughter decided to surprise us by arriving three weeks early last Tuesday. 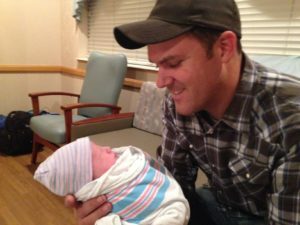 After my fifth experience giving birth, I realized I wish I had been given the advice I am about to give before I started having children. My point is, let’s just be about delivering these beautiful babies and stop judging each others’ methods of doing so. With that said- let me share with you the progression of my birthing experiences and what I learned as a result. My first two children were delivered with the blessed help of an epidural that allowed me to almost sleep through the contractions. I got the epidurals when I was dilated to a four and started to feel nauseous. I had planned on an epidural and had no training in pain management and that worked out just fine. Until my third child. Maybe I am the only woman out there foolish enough to think that an epidural would always save me from the pain of childbirth, but I had never really contemplated seriously needing any training in natural childbirth techniques. I was scheduled to be induced 2 days before my due date. I assumed this would be a breeze. I would get started, get my epidural, and after a few hours of relaxing in a hospital bed, my sweet little daughter would be in my arms. What actually happened was my baby had a rapid heart beat so the doctor was anxious to get her out where he could examine her. He stripped my membranes and things went quickly. My contractions grew rapidly more painful. They called for my epidural. It only had time to partially take effect before it was time to push. 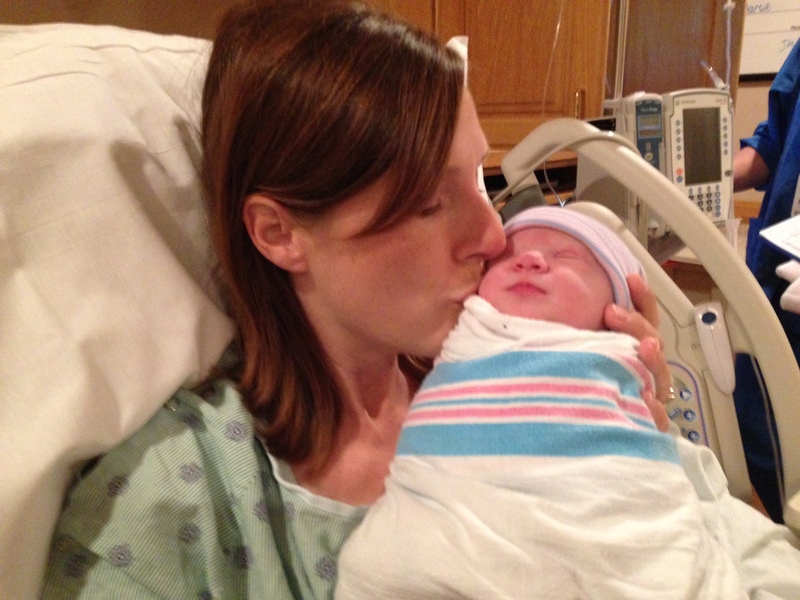 I was still feeling the contractions in my abdomen as I transitioned… and I was terrified. I had no idea how to manage the pain. My daughter was born 1 hour and 45 minutes from the time I got started. Fortunately, I was numb in the pushing area and I was very grateful for that, but this experience completely changed my outlook on preparing for childbirth. First of all, I wasn’t thrilled with the fact that I had to pay the same amount for the epidural whether it worked or not. And I was nervous that my next child would come even faster than the last because my labor times had decreased from 8 hours, to 5 hours, to just under two hours with my first three children. When I became pregnant with my 4th child, I decided to prepare to deliver him naturally- mostly for financial reasons. We were paying cash for this child and if there was a chance he was going to come faster than my epidural could take effect, I didn’t want to pay for an epidural that might not relieve my pain anyway. Admittedly, I didn’t prepare very well. I didn’t take a class or read a book. I just tried to talk to as many people who had delivered naturally as I could to get their advice. I had a hard time taking the affirmation aspect of hypno-birthing seriously. I think it is great and I know it works for others, but it was a hard one for my personality to really get into. My sister-in-law taught me some techniques she learned from her doula, and in the end, those were the things that helped me the most when I was in labor. So, I took one for the team and made it through that delivery without an epidural. I actually did really well managing the pain up until that last few contractions and the pushing. I was completely unprepared for the pain I experienced pushing. I don’t remember feeling pressure at that point- JUST PAIN! (-; But, I was grateful I at least had some techniques in my back pocket to help me get through it. I can’t imagine going through all of that with no idea how to manage the pain. I decided with my fifth baby I would spring for the epidural. There were some aspects of natural child birth that I enjoyed, but not enough that I really wanted to do it again if I didn’t have to. I knew if I was going to do it again, I would need to put some serious effort into natural childbirth training in order to find this happy place where there is pressure, but not pain, and I didn’t feel the drive to do it. Fast forward to last weekend. I started having contractions an hour after I went to bed last Sunday. My husband was driving back from a business trip and was 4 hours away. I had lost my plug earlier that day, but was surprised when the contractions started because my baby wasn’t due for 3 more weeks and I have never gone into labor that early before. The contractions were regular and grew closer together. By 6am I called my husband and told him to just meet me at the hospital and called my Dad to take me there. Strangely, once I got to the hospital, the contractions slowed and eventually stopped. I had dilated to a 3, but things just weren’t going anywhere. We went home and I tried to take it easy to see if I could get her to stay inside a little longer. But, at 7 that night the contractions started again and we ended up back at the hospital around 9:30. I was still dilated to a 3 when we got there, so the nurse waited an hour to see if I would progress. I told my husband to get some rest and I would wake him if I needed him, as he still hadn’t slept since driving all night to meet me. After an hour had passed, I still hadn’t quite made it to a 4. The nurse called my doctor and he said I could get an epidural any time I wanted one, but if I stopped progressing, I would have to pay for it even if I went home without a baby, and because she was so early, he couldn’t give me anything to help things along. I really felt like this was the real thing, but having been sent home that morning and the fact that it was 3 weeks before my due date made me second guess myself. I told the nurse I would muscle through one more hour of contractions to see if I could make some more progress before I committed to the epidural. A half hour later, the contractions became very strong and very painful. 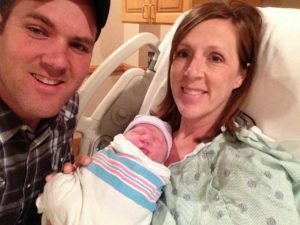 Because I had planned on an epidural this time, I hadn’t asked my husband to do all the things he did during my natural child birth to help me manage the pain. I suddenly felt all alone in my ever increasing pain and I started crying which made it impossible to do the breathing that was helping me get through the contractions up to this point. I called my husband’s name 7 times before I could wake him. He was like, “What?! How did we get here? What do I need to do?” The nurse had come in and saw how much pain I was in and went to get the anesthesiologist. By the time he got there and started my epidural, I was in transition. Fortunately, this time the epidural took full effect- so I didn’t have to go through the pain of pushing again, but if I was going to pay for an epidural anyway, it would have been nice to have had it during all the painful contractions as well. So, here is my point. There are many scenarios where you may not have the luxury of the epidural you are counting on. If you haven’t learned any pain management techniques, your birthing experience could end up being a terrifying one that you are in no way prepared for. Give yourself the advantage and comfort of knowing how to manage the pain if you are forced to. And if you go into labor bound and determined to delivery naturally, and you find out the pain is far more intense than you ever imagined it would be, and you decide to break down and get an epidural- don’t beat yourself up over it! I know a mother who delivered her first three children naturally with no problem, but her 4th labor was a completely different and far more painful experience than she had ever had and she ended up getting an epidural. Come to your birthing experience prepared for the fact that you may just need the epidural to make it through and that is perfectly fine. Or, if you have complications and end up needing a C-section, don’t let it ruin your happy day! You just brought a life safely into the world! You are amazing! It is okay to change your plan to meet the needs of your situation. This experience will either teach you where your limits currently are, or you’ll find that you have the strength to do things you never thought you could. Both are valuable lessons to help you moving forward. Doing all we can to eliminate as much guilt and fear as possible from the labor experience allows us to focus on the incredible miracle of bringing a little, sweet life into the world. Please learn from my mistakes and take the time to prepare yourself for either scenario so you can enjoy more fully your child’s birth. This is your experience. Do what you feel is right for you. Don’t feel pressured to do what someone else thinks is best for them, and therefore best for you. In truth, there will soon come a day when you won’t really be focused so much on the miracle of bringing this little person into being (however you chose to do it) as you will be in awe of the miracle of them bringing you into being through the experience of being their mother. And all the stress you may be feeling right now will seem insignificant compared to the process of becoming that begins the moment they place that infant in your arms. Here is another great read on this subject from Naomi Thomas from thebirthpro.org . She is very pro-natural childbirth, but won’t judge me for getting an epidural. (right Naomi? (-: ) Her blog is also a great resource for learning natural techniques to help you through childbirth whether you are planning on delivering naturally or not.